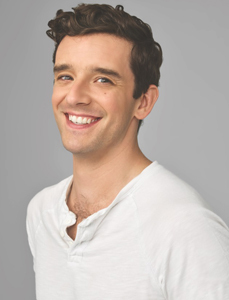 Michael Urie tells the story of stumbling across a copy of Torch Song Trilogy in his high school drama club in Texas. At the time, he imagined himself as the young runaway David. Then after Juilliard and star-making performances on television’s “Ugly Betty” and “Younger,” he started thinking of himself more as the sexually confused Ed, or maybe the hustler turned model Alan. It wasn’t until producer Richie Jackson and director Moisés Kaufman called him asking if he’d be interested in playing Arnold, did he imagine stepping into the role originally written and played by Harvey Fierstein. Now, after an acclaimed Off-Broadway run which garnered him some of the best reviews of his career, he brings his touching, hilarious, and heartbreaking turn as Arnold Beckoff to the Hayes Theater where he is originating his first ever role on Broadway. Ahead of Harvey’s Fierstein’s Torch Song opening night next week, we luckily grabbed a second with Michael On The Couch! I know it’s strange, and probably not the kind of proud you mean, but I can’t remember being as proud as when I saw Boys in the Band. Not only that my friends Michael Benjamin Washington, Robin DeJesus, Andrew Rannells and the rest were up there killing it. Not only that this messy brilliant play was on Broadway and selling like hotcakes. But, it was a full company out gay actors on Broadway playing gay characters. I was overflowing with pride. Laphroaig if it’s booze, Lacroix (peach pear) if it’s not. Tabasco. I even keep some at the theater. My daily playlist from Spotify. I listen as I beat my face for the opening scene of Torch Song. Always good stuff. Ruining my knees doing physical comedy. Worrying about my loved ones. If i don’t hear from my partner Ryan, I’m 100% sure he’s dead in a gutter somewhere. Thanks, mom! In 2005, I was doing King Stag at Seattle Rep. The play began with me as a silly Italian commedia clown dragging a giant birdcage on wheels with a man-sized bird inside. I gave the audience some backstory and then began to personally introduce myself to audience members and ask them questions about themselves. It was usually quite funny. One night, there were like three people in a row from totally different parts of the world, Japan, Russia, Africa – that varied. Really fascinating! In my frantic improvy brain, I thought I should say something about how exciting that is – it’s like looking at the United Nations! But for some reason “looking at United Nations” didn’t get from my brain to my mouth. Instead I said, “it’s like Windows on the World!”…… UM…… Windows on the World was the name of the restaurant at the top of the World Trade Center…………… WTF, brain? Humiliating. That story was almost dethroned just two nights ago when my dog wandered from the dressing rooms at the Hayes down the three flights of stairs to the stage level and into the stage right wing… Luckily she didn’t make it all the way to Arnold Beckhoff’s apartment……. Big news from Robert Mueller. Follow the green lights. (Stolen from Michael Patrick King).